Long before W Road Collection opened, I tagged along with my designer sister, Barbara Dalton, to ADAC, High Point Market and AmericasMart Atlanta. This year was even more exciting as I found inspiration at every turn. The beautiful showrooms blended different styles, creating new inspiring designs. Here are some of my favorites. Before arriving in Paris I thought I had an idea of what the Marche aux Puce de Saint-Ouen would be like- large, confusing and probably a bit overwhelming for a non- French speaking antiques buying novice. But I was not expecting how absolutely wonderful my first experience in the Puce would turn out to be with the assistance of Danielle, our indispensable Antiques Diva. We arranged our guided tour well in advance of our trip through Toma Haines at antiquedivas.com and it was well worth every euro we spent. Prior to our trip Toma and Danielle spent time asking us questions so they understood what we were looking for and what we wanted from our visit to the Puce. They also provided much needed information regarding international shipping so we wouldn’t waste time dealing with that once we arrived. I love chairs! 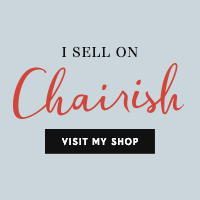 Dining chairs, big comfy chairs, quaint side chairs, statement pieces, sets, pairs and singles- I love them all. I considered having a booth devoted to nothing but chairs. I still think it could be visually very interesting. A friend recently told me that I could not buy anymore chairs until I sold the ones I had. She has a point; however, I recently bought a few more that I just couldn't pass by.